3 years ago i fractured my mid-shaft bone on my left foot. Unfortunately i went to a centra care clinic and was given a boot and crutches and told to stay off of it and make an appt with a Podiatrist. 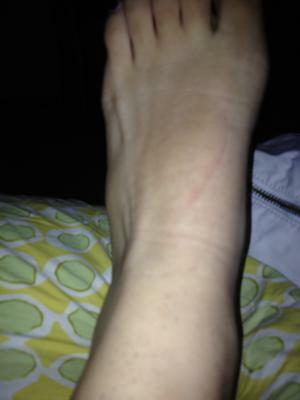 My mother never took me so my bone healed but, as u look at my foot you can see the bone kinda sticking out. Now 3 years later i'm having pain on that foot and it seems to have very little little swelling around the bone.. I am able to walk on it but, it does hurt a little when i do so. I currently am wearing a band on it and its a little tight and it feels like its pushing the bone, it helps keep my foot supported. I would like to know what i can do to help this? I'm really trying not to go to the doc because i currently do not have insurance. I would greatly appreciate any help. Thank you. From a very practical standpoint, there is very little you can do on your own. Yes, you can keep it wrapped and if that helps you, and minimizes the pain then you should probably be able to get by. The proper way to treat this would be to see a doctor. I understand the insurance thing but unfortunately you need an x-ray to see what is going on. You do not mention if the fifth metatarsal base has been swollen for three years or if that is a new event. If the swelling is a reasonably new occurrence then that could signify a different problem. the tendon where it attaches into the bone. It may then have partially healed leaving you with swelling and pain in the area. There is also the bigger problem of perhaps the fracture of the fifth metatarsal base never healed. This is a common problem with fractures of this nature because of the poor blood supply to that portion of bone. The swelling could represent what is known as a hypertrophic non-union. In this instance the body attempts to repair the broken bone by "building a bridge" across the fracture, but is never quite able to fix the fracture site, or at the very least, partially fixes the fracture site. So you are left with a swelling in the area and along with the swelling will be varying degrees of pain. Like anything else, some people will live with the pain, others will attempt to have the problem fixed. This problem is usually best resolved with surgical intervention, where all the excess poor healing bone is removed, a bone graft is put in place and then fixated with a screw or other forms of compression. Looking at your foot, I have no idea what your specific problem is and that is why you would need to see a doctor in your area. At the very least an x-ray would be needed to see the condition of the old fracture. You might consider calling around to various offices and seeing if any of them offer discounts for cash paying patients without insurance. In this day and age of patients either having no insurance or insurance with high deductibles, many offices will work with patients so that they can the care that they need. I am not sure how old you are, but if you are a minor, I would suggest you discuss your problem with your parents before seeking any medical specialists.